Duck is a popular recipe option in restaurants and home cooking in Europe. To my surprise and in contrast to the US, duck is featured on restaurant menus more often than is chicken. Duck is easy to prepare and has a rich flavor. As with buying chicken, always look for organically raised, cage-free duck. Preheat oven to 400° F. Pierce each sweet potato several times with the tines of a fork. Place the sweet potatoes on a rimmed baking sheet lined with foil. Bake until tender, about 40-50 minutes. Meanwhile, with a small sharp knife, score duck skin in a crosshatch pattern. In a bowl, combine duck breast, oil, salt, black pepper, and thyme. Marinate stirring occasionally. In a saucepan, add port wine and salt. Heat to a gentle boil and reduce heat to a simmer until volume has reduced from 1 cup to ¼ of a cup, and sauce thickens to syrup, about 25 minutes. When sauce is properly reduced, set aside. When the sweet potatoes are 10-15 minutes from being adequately baked, heat a sauté pan to medium-high heat. Pour duck marinade sauce into the pan, and sear duck skin side down covered for about 5-6 minutes, skin should be a little crispy, then sear the other side for another 4-5 minutes until cooked. Please note that the USDA recommends cooking duck breasts to an internal temperature of 170°F (medium to well done) to ensure that any harmful bacteria are killed, but most restaurants (with the proper health warning) typically serve duck meat medium-rare and cook it to only 140-145°F. Once duck breasts are cooked, and sweet potatoes are nearly baked, return reduced port sauce to low heat. When tender, remove sweet potatoes from the oven, make a slit in the top of each sweet potato. Spoon sweet potato from skin into a food processor. Add ghee, salt, cinnamon, and warmed almond milk. Purée until smooth. Meanwhile, cut duck breast into ½-inch thick slices at a 45-degree angle. To serve, spoon mashed sweet potato mixture on each plate. 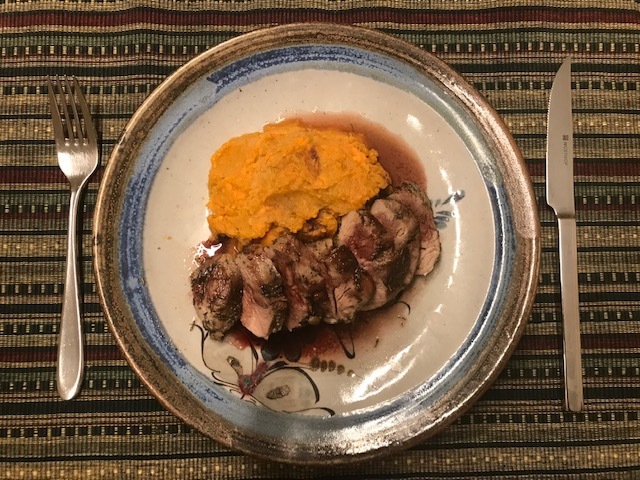 Fan duck slices over the sweet potato, and drizzle warm port sauce over duck and serve immediately.